Which is the better tablet -- Apple's iPad 2 or Samsung's Galaxy Tab 10.1v? Apple's hotly anticipated iPad 2 has finally in Australia, and it is predictably flying off the shelves. If you're not interested in Apple's tablet at all, there are some valid alternatives to the iPad 2, headed by the Android-powered Samsung Galaxy Tab 10.1v. Read our comprehensive iPad 2 and Samsung Galaxy Tab 10.1v previews, and check out our guide to the best upcoming tablets in 2011. 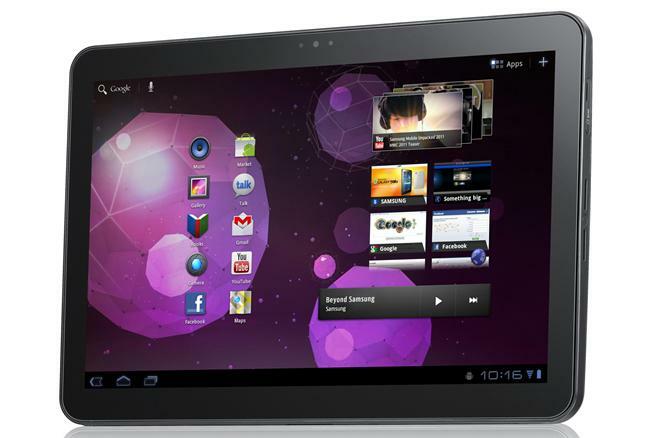 As its name suggests, the Samsung Galaxy Tab 10.1v has a 10.1in display with a resolution of 1280x800, meaning it will compete directly with the 9.7in iPad 2. With this in mind, how does the Apple iPad 2 stack up against the Samsung Galaxy Tab 10.1v when it comes to specifications? The new iPad 2 is faster, thinner and lighter than its predecessor. The iPad 2 is 33 per cent thinner than the original iPad, weighs 613g, and comes in both black and white models. The curved design of the back of the iPad 2 makes it comfortable to hold, and it is relatively thin given the size of its screen. The iPad 2 remains a little awkward to hold in both portrait or landscape layouts, so it's best to prop it up against an object. Apple's iPad 2 is lighter, thinner and faster than its predecessor.